Mark Watson is a naturally funny man. To prove the point, the stand-up, who is the father of a newborn baby, begins our chat by telling me how shattered he is. “My phone is currently at three per cent power, which is a reasonable metaphor for the state of my life right now. You’ll be delighted to learn that Mark is bringing this trademark wry, self-deprecating sense of humour to a theatre near you very soon. Following a sell-out run at the Edinburgh Festival, this magnetic comedian is embarking on a most welcome 65-date national tour with his wonderfully entertaining new show, entitled “Flaws”. In the show, which marks his tenth anniversary in comedy, Mark explores why, despite our lack of perfection and poor decision-making, humans are still pretty spectacular. Even though he may not possess the answer to all of life’s most serious questions, the comic reflects with his customary hilarity on the process of growing up, including the terrifying ageing process, parenthood and the fear of passing terrible traits onto your children. In this thought-provoking adventure, he examines human character defects and the effects his own flaws have had on his life. This is Mark’s most personal and funniest show to date. When we meet in a North London cafe in the run-up to the tour, Mark shows himself to be a rare example of a comedian who is as engaging off stage as he is on it. He makes for brilliant company; our hour together is punctuated by the sound of laughter. The stand-up, who in 2006 won both the Panel Prize at The If.comedie Awards and the Time Out Critics’ Choice Award, can be summed up by all those adjectives beginning with C: charming, comic, chaotic and completely compelling. But I’m not the only fan of this marvellously self-effacing stand-up. The critics have also been queuing up to praise the comedian who is widely regarded as one of the finest acts on the circuit. The Times called him, “The highest achiever the Edinburgh Festival has seen this decade. A huge comic presence.” Meanwhile, The Guardian described him as “A prodigy”, and the Daily Telegraph said he was, “Simply exhilarating”. Mark is a peerless live force, and he simply can’t wait to be performing stand-up once again. The comedian, who has also recently starred with Henning Wehn in Dave’s new show, Road To Rio, explains just why he loves the live arena so much. The comic, who on radio has presented the well-regarded shows, Mark Watson Makes The World Substantially Better, 100 Million or Bust and Mark Watson’s Live Address to the Nation, continues that, “People instinctively feel that stand-up must be terrifying because the performer is so exposed. “There is no doubt that I find it nerve wracking. Comedians who feel no anxiety have simply become machines. But in a live show, at least you are in control. With TV, what you do might only be reflected in five per cent of the final edit; you’re just a cog in the wheel. Even if you do well, you’re at the mercy of casual audiences who might decide they don’t like you within five minutes and write nasty things about you on the Internet. Mark, a fully-fledged Edinburgh Fringe legend who has in the past manfully performed marathon 36-hour shows, carries on that he finds touring the most rewarding of all experiences. “It’s so satisfying. Most comedians want to get to the point where rather than being just another act on the bill, they are touring under their own name. I don’t aspire to much more than having a couple of hundred people who’ve bought a ticket with my name on it – even though some of them might not know who the hell I am! The stand-up, whose debut DVD, “Mark Watson Live”, is available now, goes on to outline what subjects he will be covering in “Flaws”. “It’s not unusual that, like me, a comedian claims to be performing, ‘His darkest, most personal show’. Hardly anyone has written an entry to the Edinburgh programme saying, ‘I don’t give a toss – I’m just going through the motions with a trawl through my old routines’. These days PR people stop us telling the truth like that in our blurbs! So a lot of observational comedy is performed by people like me talking about things that have gone wrong. The comedian, who has also appeared on We Need Answers, Never Mind the Buzzcocks, Mock the Week, Would I Lie to You, Have I Got News for You, Live at the Apollo, Michael McIntyre’s Comedy Roadshow and Channel 4’s Comedy Gala, continues that, “The stuff I talk about on stage is not that different from my real life. I have a definite shtick – a slightly manic nervous energy which makes something of my incompetence and general failings. But that’s actually very similar to how I conduct my life. The effect of that on my mental well-being is ambiguous. If you’re performing a version of yourself, it’s quite easy to lose track of where your real self begins and ends. Mark, a Cambridge graduate and former Footlights performer who is one of the most intelligent and articulate comedians around, proceeds to go into further detail about the show. “I’m interested in the whole idea of flaws and fallibility. Perfection is not possible or desirable for humans. The denial of human quirks and flaws is not healthy. But the fact that you know others have flaws doesn’t necessarily comfort you. As you can see, it is a pleasure to spend time in the company of this immensely likable comedian. Never very far away from the next gag, Mark closes by joking how relieved he is, after the exhaustion of new fatherhood, to be indulging in a sneaky rest on tour. “My life is out of control,” smiles Mark, who is also a successful novelist and whose latest book, Hotel Alpha, has just been published. “So going on tour will be a great relief – I can’t get out on the road quickly enough! Performing the show has become the least stressful part of my day. All I have to do is stand up and talk for an hour – that eclipses all my other problems. And the cafe once more fills with the sound of laughter. 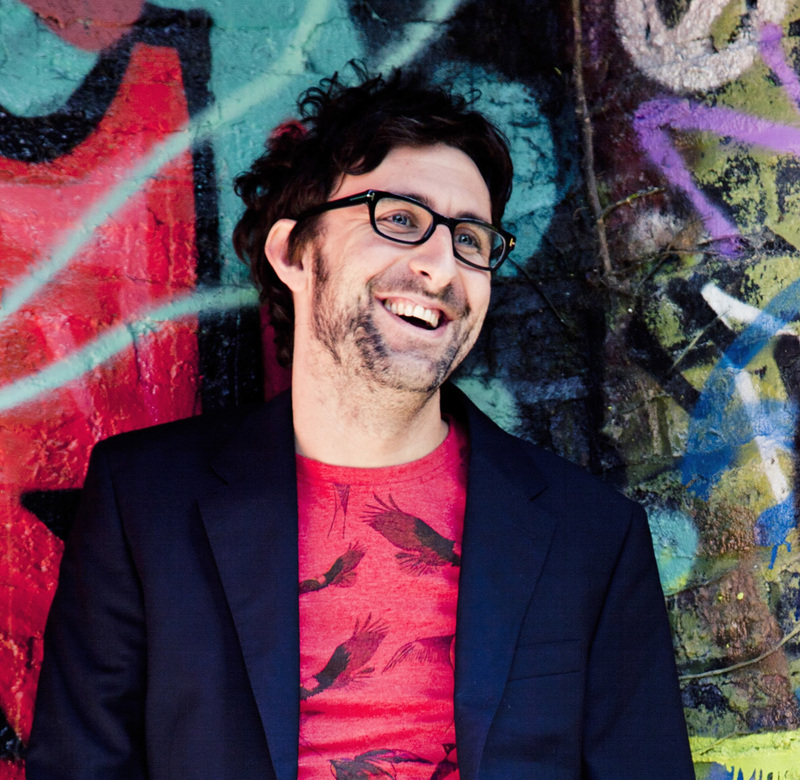 See Mark Watson: Flaws at the Lowry on 9th November 2014. His novel Hotel Alpha published by Picador is out now, RRP £14.99. For more information visit www.markwatsonthecomedian.com.